The folks over at Theme Thursday are taking a new approach starting this week. They've decided to begin each month with a colour as their theme. This month's colour is RED. So, here's my ode to the scarlet colour. 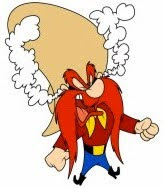 Such as "in the red", "better dead than red", or simply "red head"
wonder if he will change color when he does? Yankee fans should f-off even when there isn't a sale. Red is also the color of the cup I'm using to drink my Diet Dr. Pepper. "Red" reminds me of bloodshed and Valentines, and somehow they seem to work sooo well together. Especially if you have a girl and forget about it. Brian: Bluebirds are another sect. Moooooog: I've "read" your comment and understand. 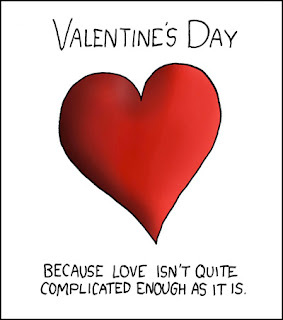 Quirks: Of course it is. It would have to be, wouldn't it? Jasmine: I was a Ginger when I was younger! Willow: I had to find a Sam with smoke coming out of his ears. It conjures up a vision of when my son was young. We always used to tell him we could see the smoke when he was upset about something. Don: And are you speaking from experience, Red? I can't wait for the red-breasted robins to come back in the spring! AmyLK: We get a lot of robins and cardinals in our area. It'll be nice when winter ends. Me-Me: Aw, shucks, now I'm red-faced. Love the Red Sox sign! As a long-time, enthusiastic citizen of the Red Sox Nation, I thoroughly agree with the sign (and with Moooooog35). We have a popular bumper sticker up here that says: "I root for 2 baseball teams - the Red Sox, and anybody who beats the Yankees." Absolutely! Kat: Why, thank you! I'm happy you "read" it. Tom: Good question. We'll still have snow, so I suspect white. Wonderful, wonderful. Go, Red Socks,go!! Dreamhaven: I seem to have attracted a lot of Red Sox fans. 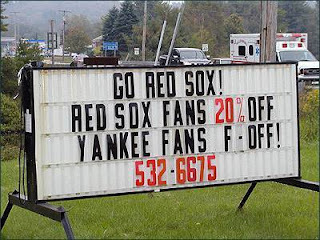 aww... picking on the yankee fans already? pitchers and catchers haven't even reported yet! "Nonamedufus" has been included in this weeks Sites To See. I hope you like the image I featured, and I hope this helps to attract many new visitors here. Jaime: I guess some Yankee fans are "seeing red"! FishHawk: Wow, thanks for the promo on your site. Appreciate it! Skye: Just what are you trying to tell me, Skye? 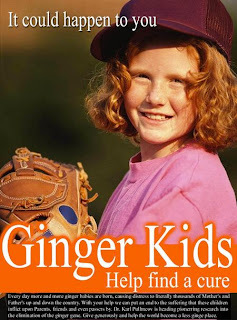 Haha . . poor bloodnuts, I'm so glad I'm not a freckly redhead. 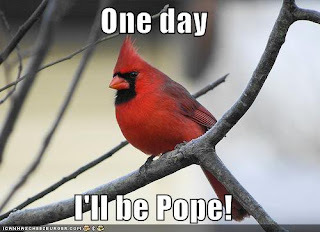 As for the cardinal, he'd do a better job than the pope and ultimately more cheerfully! Love your blog by the way. I rarely comment except on Thursdays but it's a treat to read. Baino: Thanks, I appreciate you visiting. Skye: Uh-huh. Yeah, I see.